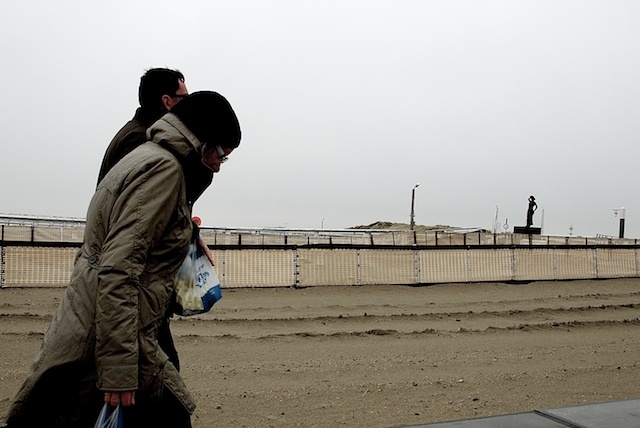 When the forecast was for weather other than of the kind our overly generous hosts would have preferred, they suggested we take a ride on the Tram to Nieuwpoort. This they assured us would keep us warm and perhaps dry and on the way we could decide from which stop to alight to meander home. They mentioned in passing that perhaps strategically, "down-wind" would be a good starting direction for our walk. We took no notice of the little voices in our heads and followed them out the door. What a treat that outing would have been on a sunny day. Streets abuzz with people, sun sparkling off the water, the most incredible collection of sculptural pieces along the waterfront boardwalk beside the largest marina in Europe, and fish markets and holiday shops abuzz with activity. Today it was definitely a treat, but of a different kind altogether. It seemed as though our hosts, who are entirely accustomed to the cold were themselves not entirely sure that they enjoyed being out at all. Although we could happily assure them that we were (sure, that is) it seemed that no one else in Belgium was actually going to venture out this day either. When one can walk for a few hours with bags of fresh seafood under arm, and one's only concern is to stop the fish freezing on the way home, for the Antipodeans in our group the experience is to say the very least, novel. As we watched the sun peek through in the dry mid afternoon warmth of the fifth floor apartment, we assured our hosts that we were very happy indeed not to venture out to see the sculptures that we had missed in the morning's outing. They in turn, assured us as we helped them dispose of a great feast of local delicacies from the sea, that we had experienced a day which was perhaps typical of it's kind. A day when one ventures out into the cold, warms up with soup at half time in a cafe to fortify oneself for the journey home, then arrives home more grateful than ever for the miracle of central heating.